This gorgeous sunset scene was stamped with one of the images from Serene Silhouettes. This stamp set was the first one I ordered from the new catalog. I just love all the images in it. I'm a sucker for silhouette cards anyway and this set is just perfect for making silhouettes. The image was embossed because we were sponging over it and I didn't want to smear the ink. After embossing we cut it out with the new Framelits dies. Then we sponged on the color. 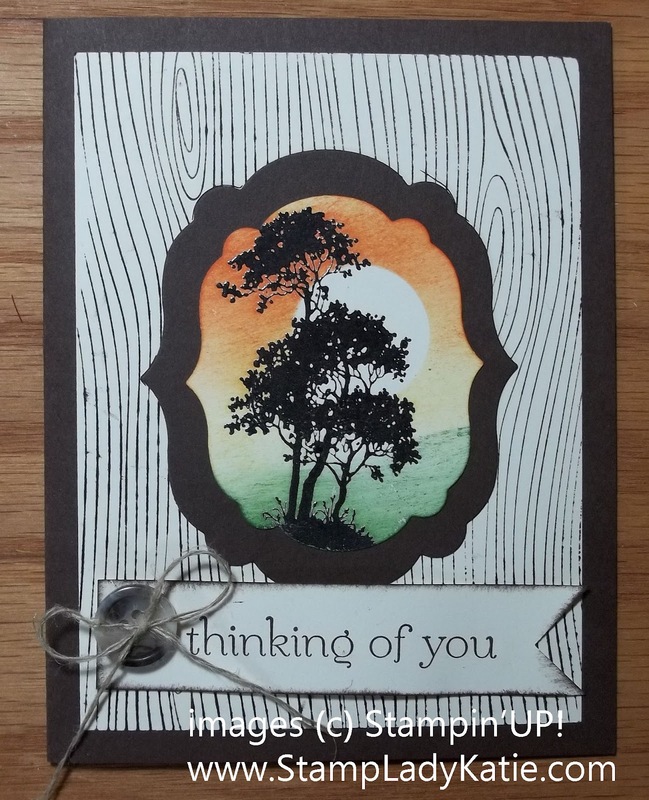 Do you like the "sun" behind the tree? After we embossed the image we then punched a circle from a post-a-note. We placed the post-a-note where the sun was to be and sponged over it. The unsponged area became the sun. The technique is just like the moon on the polar bear card. I'd meant to most this photo when I shared the polar bear card and somehow got sidetracked talking about the Iridescent Ice on the snow and the stamp set. So here it is - it just shows the technique for using a post-a-note to mask when sponging a sky.